Learning how to use a chainsaw properly is a wise investment of your time because not only are chainsaws one of the most common power tools or homeowners but they are also the most dangerous tools. We cover every aspect to operating a chainsaw to give you the knowledge to cut safely and efficiently. Welcome to our informative guide on how to use a chainsaw properly, including maintenance, battery vs electric, how to start a chainsaw (and what to do if your chainsaw won’t start) — and so much more. We hope you find this guide helpful. If you are a complete novice when it comes to chainsaws, or plan to purchase one in the near future, then this article is for you. There are plenty of chainsaw reviews out there on the internet, but this isn’t going to be like one of them. Instead, we shall be taking a ground up approach in order to establish the fundamentals of chainsaw operation. Reading this guide will give you an insight into what a chainsaw is, how it works, and most importantly – how to operate one. But that’s not all, we shall also discuss about chainsaw safety and maintenance, since those two aspects of operating a chainsaw go hand in hand. Just like a dull knife can often be more dangerous than a sharp one, using a poorly maintained chainsaw can result in the loss of life or limb even when you are obeying all the safety rules. Conversely, there are many cases of chainsaw accidents in which people have injured themselves while operating a perfectly well-maintained chainsaw, because they were not wearing proper safety clothing/ ignoring safety procedures. Always do your research, wear the proper safety equipment, and obey the local laws. Remember, a chainsaw is a very powerful tool, and potentially the most dangerous handheld power tool in existence. It can drop giant trees within a matter of minutes and cut through flesh and bone with ease. We have designed a step by step guide on how to operate a chainsaw, and it involves various stages – what to do before starting a chainsaw, how to start the chainsaw, and handling it properly, etc. There are plenty of chainsaw manufacturers out there, and each manufacturer makes hundreds of different chainsaw models. However, all chainsaws have some common features that we shall discuss in depth later on in this article. Knowing these common features will allow you to pick up any chainsaw and immediately get an idea of how to operate it on a basic level. But don’t consider this guide to be a replacement for the user manual. Now without further ado, let’s get back to the actual chainsaw operation guide. What is a chainsaw & how does it work? A chainsaw consists of 3 main parts – the powerhead, the chain, and the bar. 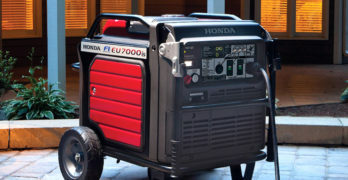 The powerhead can either be a two-stroke gasoline engine or a high speed electric motor depending on whether we are talking about a gas or electric chainsaw. The chain is made up of interconnected steel links with cutting teeth mounted on top of the links, simulating a conventional saw blade. And the bar is the frame that this saw chain is wrapped around, it provides a supporting structure for the cutters to spin around. Modern chainsaws come in numerous sizes, and can use several types of chains in order to cut through various materials such as wood, ice, concrete, etc. We will discuss more about the saw chain anatomy and guide bar in a later portion of this article, for now let us focus on how a chainsaw converts fuel into work. In the case of a gas chainsaw, gasoline is stored in a tiny fuel tank located nearby the 2-stroke, single cylinder engine. The capacity of a chainsaw fuel tank ranges between 0.7 to 1.5 liquid pints, and the cylinder displacement size is usually between 30 to 60cc. Even though it may seem that an engine this small is not capable of felling a giant 100-foot tall hardwood tree, chainsaws are routinely used for collecting timber and firewood, as well as clearing giant patches of trees in the event of a forest fire. You see, it is not about the actual amount of power itself, but how you apply it. A 600 horsepower V8 sports car is equipped with a very powerful engine, but you don’t see lumberjacks using one of those to fell trees. The real key to the performance of a chainsaw is the bar and chain assembly – a saw chain holds around 30 to 60 cutters, and spins around the bar at speeds of up to 70 mph. At these speeds, each tooth on the saw chain will strike the wood more than 20 times per second, enabling you to fell giant trees within minutes. 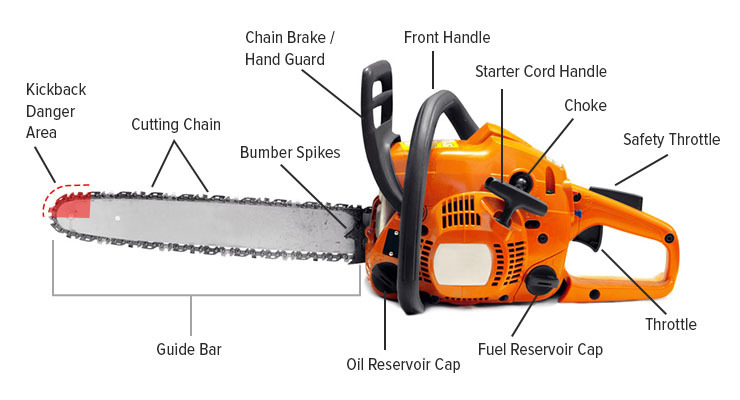 Gasoline chainsaws use single-cylinder, 2-stroke motors in order to keep the entire system compact and lightweight. Four stroke engines are more efficient and run cleaner, but they are also more complicated in design and don’t generate nearly as much power per pound of engine weight (on average, a 2-stroke motor develops one horsepower per pound of engine weight!). Most medium to large-size gasoline chainsaw engines generate between 1.5 to 3 horsepower, and are connected to the chain through a drive assembly that consists of a clutch + drive sprocket. The clutch enables you to keep the motor running even when the chain is on idle, because constantly pulling the starter cord every time you want to get in position for cutting can be a very tedious task. How does the clutch work? Well, all gasoline chainsaws have a throttle lever attached to the operating handle that lets you control the amount of air and fuel mixture released into the engine. Whenever the engine is running too slow, the clutch is in a “disengaged” state, and will not spin the drive sprocket that moves the saw chain. When you press that throttle a little harder, it will cause the engine to rev up, and this “engages” the clutch, which in turn spins the drive sprocket and the chain begins to travel around the guide bar. The clutch used in a chainsaw is nothing like the one used in your car, this one is much simpler in design. It is called a centrifugal clutch, and is found in mopeds, chainsaws, lawn mowers, go-karts, and even in some expensive competition yo-yo’s. As the name implies, this type of clutch uses centrifugal force to transfer power from the engine drive shaft to the sprocket. Imagine this – you are holding a string with a stone tied to the end. As you spin your arms in a vertical motion, the stone will move along with the string. If you spin your arm fast enough, the stone will spin in a perfect circle, and you can feel it tugging at your arms trying to fly away from the center of motion. This is the same kind of force that causes a centrifugal clutch to engage. Inside the clutch, there are multiple weighted arms with friction pads attached to the outer surfaces. These arms are loosely held together by tensioned springs, connected to a central drive rod which is directly attached to the engine crankshaft. There is an outer drum, also known as the clutch drum located right on top of this assembly. Behind the clutch drum, there is a drive sprocket whose teeth sink into the saw chain links, whenever this sprocket spins, the chain will also move. But as of now, there is nothing moving the drum, so the chain is on idle. But as you begin to press the throttle harder, it causes the internal drive rod to spin faster, and the weighted arms start flying outwards, pulling against the springs that are holding them together. At some point, the centrifugal force will overcome the spring tension, and these arms will strike the drum, causing it to spin at the same speed as the engine. And there you have it, that is how a chainsaw functions at least on a basic level. There are many other components that go into a gas chainsaw such as the spark plug, magneto, pull starter, carburetor, air filter, etc. but that is a discussion for another day. We have covered the functioning of a chainsaw in more detail on one of our other chainsaw articles that you can check out if you wish to. An electric chainsaw functions very much like a gasoline one, except it uses an electric motor and requires far less maintenance. It is also quieter and much easier to start since you don’t have to pull any cords or mix fuels. An electric motor is capable of achieving its maximum torque almost immediately upon starting up, and this aspect of electric chainsaws has its advantages as well as disadvantages. More on that in the safety section of our chainsaw guide. 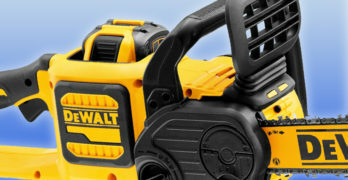 Electric chainsaws come in two flavors – corded and cordless. 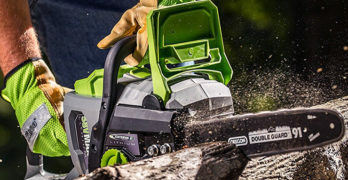 Cordless chainsaws are slightly more expensive and heavier than their corded counterparts, but give you the freedom of mobility that you can never get from a corded model. Now that you have understood what a chainsaw is and how it functions, let us talk about some of the areas of application for these wonderfully simple, yet highly effective handheld machines. As most of you already know, chainsaws are primarily used for cutting wood. Okay, that was a no-brainer, right? But wait – there are several types of wood cutting, and not all of it involves timber/ firewood collection. For example, firemen use professional grade chainsaws to clear giant patches of forest in the event of a forest fire. This prevents the fire from spreading deeper into the jungle, or into inhabited areas such as cities. Firemen also use chainsaws to cut down diseased or old trees, so that they don’t fall down on a house or passerby. Chainsaws are used by rescue and evacuation personnel to clear a path in the event of a natural calamity. Specially purposed chainsaws use chains equipped with carbide cutters that can slice through extremely hard materials such as concrete, steel rebar, and metal sheets. Construction workers use chainsaws for cutting through stone, tarmac, etc. Chainsaws are even used by ice carvers and artists for shaping ornamental sculptures. The chainsaws used by artists (both ice and wood) are extremely small, and are designed to make precise cuts. Pole chainsaws are used in vineyards and orchards since their elongated design allows you to safely cut down branches and prune tree limbs without the need for a ladder. Homeowners use the chainsaw for pruning trees and brushes in their yard, or for collecting firewood. DIY enthusiasts use chainsaws for making wooden boards, planks, poles, etc. for their various home improvement/ recreational projects. Canadian redwood harvesters wield giant 5’ professional-grade saws for felling and bucking trees, while commercial divers use stainless steel pneumatic chainsaws for salvage operations. The good old gas vs electric debate has been going on for several decades by now, and it seems as though there is no clear winner just yet. Who would have guessed, it is almost as if different people have unique needs (duh?). You will find supporters of either camp claiming stuff like “Oh, but gas-powered chainsaws are more powerful”, or “Well, at least an electric chainsaw doesn’t wake up half the neighborhood”, and so on. There are pros and cons for either type of power source, and we shall take an objective look at both electric as well as gas chainsaws, in order to give you a better perspective on which one might be more suitable for you (or maybe you could use one of either type?). Can be powered by battery or wire. Wireless models will cost more and are also heavier, but are the closest you can get to a perfect chainsaw in terms of quietness and ease of use. They offer you the mobility of gas chainsaws, along with the low-maintenance and low-noise output that we have come to expect from electric models. Some of the more powerful 16” and 18” cordless models will allow you to fell small to medium-sized trees, and are quite good for chopping firewood in the middle of a forest. But if most of the cutting that you do is on home grounds, you might want to consider a corded-electric model since it will be cheaper for the same amount of cutting power, and also lighter so you can hold it for longer periods of time (doesn’t necessarily mean it is more comfortable to use, since there is a giant cord sticking out the back). Electric chainsaws can be used in the basement or garage without waking up your whole family, so DIY enthusiasts really love these for how quite they are. They also don’t produce any smoke, so that’s definitely a good reason to use them indoors. Electric chainsaws barely require any maintenance, other than the occasional oil change. There are no spark plugs to replace, no starter cords to pull, and no fuel + oil mixes to worry about. Perfect for use in orchards and public places such as schools, golf courses, etc. Yeah, electricity is a quiet and clean power source that is extremely easy to transport and store. However, electric chainsaws can prove to be rather useless in the event of a power cut (which is usually why firefighters, rescue personnel, etc. carry gas chainsaws). If you live away from the city, or in an area that is prone to storms, then a gas chainsaw might be what you need. Do you go out into the woods on a daily basis to collect timber and firewood? Then you need something that does the job quickly, and doesn’t rely on electricity. Gas chainsaws are more powerful per pound, there is no doubt about it. Yes, they are also harder to maintain and stink. But when you are really serious about cutting large logs of wood or felling multiple trees in a single day, accept no substitute – the gasoline chainsaw is your best friend for heavy duty tasks. Best for heavy duty stuff like felling, limbing, bucking etc. Maintenance involves taking apart and cleaning the various internal components such as the spark plug, carburetor, air filter, etc. Read our indepth article on electric vs gas chainsaws. So, let’s assume that you are an average joe who has never operated a chainsaw in his life. But recently, you came across a situation that made you think “what if I purchased my own chainsaw instead of hiring tree service?”. It could be a tree in your backward that is growing dangerously close to the house, and you want to chop off the branches before one of them pops through your bedroom window. Or perhaps, you just want to do some light pruning work in the garden. Have you recently acquired an interest in DIY work? Whatever the reason may be behind your need for a chainsaw, it is extremely important that you understand all the safety procedures and techniques of operation before you pull that brand-new chainsaw out of the box and spin it up. This step by step guide will walk you through the various stages of chainsaw operation, after which we shall delve into saw chain and guide bar maintenance. But first, it is extremely important that you understand the scope of this guide. It is not meant to replace a proper training course under the guidance of a certified instructor, nor do we recommend that you use our guide as a substitute for the owner’s manual that comes with every chainsaw. It is a basic rundown of all the things to keep in the back of your head before you go ahead and start up a chainsaw. We aren’t going to cover certain aspects of chainsaw operation such as how to fell a tree, since an entire book can be made just on that one topic. Frankly speaking, learning how to fell trees isn’t something that can be taught through an article, you need training from a certified instructor and actual experience for that kind of stuff. So, what are we going to cover in this guide? Well, after reading this you shall be able to take your chainsaw out of the box, inspect it to make sure that everything is in good condition, fuel it up, start it in a safe manner, and complete some very basic cutting maneuvers. We will also talk about what to do when the gas chainsaw doesn’t start, and give you a rundown on how to make sure that your work environment is perfectly clear and free of potential hazards before you pull the starter cord. Inertia chain brake – This is the dark-colored lever that can be found at the front of the powerhead, next to the front handle. It is the single most important safety mechanism on any chainsaw, and it is mandatory by law that all manufacturers sell chainsaws with chain brakes installed. This device is meant to protect the user in case an incident of kickback occurs. Kickback is when the front tip of the bar touches whatever it is that you are cutting, and the rapidly spinning chain gets pinched or strikes a really hard object (like a nail stuck in the wood). This causes the chainsaws to swing back at the operator’s body with tremendous force, and it all happens within a fraction of a second. The chain brake activates when the saw is swinging towards you, and your hand that is on the front handle pushes the brake lever forward. This should instantly stop the chain, preventing severe injuries. Another way that the chain brake can activate, is through the force of inertia. Since the brake lever is somewhat heavy be design so that it doesn’t accidentally activate while you are swinging the saw, the extremely high speed of the kickback will cause the inertial force of the brake lever to activate the braking mechanism even before your forward hand strikes against the lever. Throttle interlock – To make sure that the saw chain doesn’t start spinning accidentally when you are holding the chainsaw, a secondary lever or paddle is located on the outside of the rear handle. Both the throttle interlock as well as the throttle must be depressed simultaneously to start the motor. Throttle – This is the trigger located on the inside of the rear handle, it allows you to control the power output of the chainsaw. In gas chainsaws, the throttle is connected to the carburetor and regulated the amount of air + fuel mix that flows into the cylinder. In electric models, the throttle directs an electronic regulator circuit that controls the amount of electric current flowing through the coils of the motor. Rear handle – This is the handle located to the rear of the powerhead, and acts as a pivoting point from where you direct upwards/ downward movement of the chainsaw bar while cutting. It also houses the throttle and throttle interlock. There is a wide and hard plate on the bottom of the rear handle which is designed to block a broken chain from flying into your hand. The rear handle is always occupied by your dominant hand, while your supporting hand is put on the front handle. So, if you are right-handed person, you will have your right hand on the rear handle, and your left hand on the front. Front handle – Designed to be held by the supporting hand, this handle loops all the way around the sides and top of the chainsaw powerhead. It is made from metal tubing, with a polymer grip coating on the top. Chain catcher – A little metal spike located on the underside of the chainsaw, right beneath the point where the bar meets the powerhead. If a chain link breaks, or if the chain derails, the chain catcher will stop the chain from looping around to your hands. Oil cap – Usually located towards the front of the powerhead, positioned close to the bar and chain assembly. This is where you put in the lubrication oil for the bar and chain. Shut-off switch – Allows you to instantly turn off the engine/ motor. Choke – If the engine is being cold started, you will need to use the choke. Warm starts do not require the use of a choke. The choke lever controls the amount of air flowing into the carburetor. Decompression switch – Only found on specific gasoline chainsaw models, pushing this button will release some of the compression from the combustion chamber during the starting procedure, so the engine will turn more easily when you pull the starter cord. Once the engine starts, the valve will reset to a closed state. Some high-end models have automatic decompression systems which operate independently of user input. Starter cord (recoil start) – A loop of cable with a handle on the operator end that assists you in starting the 2-stroke engine of a chainsaw. This cord is connected to a spring-loaded pulley which is connected to a magneto. This magneto uses the spinning motion of the spool to ignite the initial spark that fires up the engine. Fuel cap – This is where you put in the gasoline + oil mix. The first thing you must do before starting up a chainsaw is make sure that you are wearing all the necessary “PPE” or personal protective equipment. For chainsaw users, this includes – a hard hat, hearing protection, safety glasses, leather gloves, chainsaw chaps, and heavy-duty boots (preferably with steel toes). The hard hat is going to protect your head from falling branches if you are out in the woods, while the hearing protection will ensure that you don’t go deaf from the 90+ decibels of noise coming out of a gasoline powered chainsaw. Eye protection is also very important, since the chainsaw is going to fling tiny chips of wood away from the backend as it slices through a log. If any of these tiny pieces of wood fly into your eye, they will cause damage. Besides, the surroundings can get pretty dusty while cutting wood and a good pair of safety glasses will ensure that your eyes stay clean during the work session. If you are cutting wood with a chainsaw, the single most important piece of protective equipment that you can have is the chainsaw chap. A pair of chaps will protect your thighs and knees from getting sliced open if you accidentally thrust the saw into your lower body. If you check the statistics, a majority of chainsaw related injuries happen to users who don’t wear proper safety equipment such as chaps or gloves. Chaps are a must-have for newbies and professionals alike, it is better to spend a couple hundred dollars on a good pair of chaps than live the rest of your life without legs. Finally, get a nice pair of working boots, preferably ones that have steel toes. Good boots will ensure that you maintain a proper stance at all time, and the traction between your feet and the ground will be better. Now that you have worn all the protective equipment, do a quick check on the surroundings. Make sure that there are no people or animals within a 15-foot radius of the chainsaw, and if you are cutting a tree stump or log, check the elevation/ slope of the ground nearby to make sure that the log doesn’t fall down and roll away after being cut. Clear all debris from the ground before you put your saw down in order to start it up. We recommend that beginners put their saw down on the ground in order to start it, once you are more experienced with your chainsaw you can start it up from the standing up position. Make sure that the saw is properly lubricated and filled with fuel before you start it. Most modern gasoline chainsaws come with transparent view windows that allow you to monitor fuel levels, as well as bar and chain oil levels. Once you have completed the fuel check, start to inspect the chainsaw and see if any part is loose or cracked. Give the chain and bar a quick inspection to make sure that none of the chain links are broken. Tug on the chain to make sure that it is mounted properly, it should extend outwards up to 1cm when tugged from the middle of the bar. If it’s too tight, the chain will damage the bar. Too loose, and it will slip while cutting, or even derail and harm the operator. We have more details on how to maintain the bar and chain later on, so don’t worry if you have a loose chain or bar – we’ll tell you how to fix that. For now, this is a basic rundown of all the safety checks you need to complete before starting the chainsaw. This step is to be taken only after you have worn all the proper safety equipment, and have tested the saw for fuel and oil as well as chain tension and integrity. Now, take the chainsaw and place it on a clean, flat surface that is relatively free of debris. Stick your right foot into the rear handle and put your right toe where the throttle lever is, while simultaneously holding the front handle with your left hand. Activate the chain brake manually by pushing the lever forwards. If the chainsaw has a decompression switch, you can go ahead and press it. Some chainsaws will also have a primer bulb that you will need to push in a few times in order to “prime” the engine with some fuel before you start it. If this is a cold start, pull the choke lever out to its farthest position so that it is “on” (closed). Now, tug on the starter cord for a couple times to make the engine “pop”. It still hasn’t started just yet, so disengage the choke (push it back in to half throttle) and pull on the cord again until the engine finally “starts”. Now pick the saw up and hit the throttle once so that the engine speed drops to idle. If the engine is already warmed up, you don’t have to use the choke. Just follow the rest of the steps in the same order. If the chainsaw won’t start despite being warm, turn the choke “on” and then switch it back into “off” position right away. Now pull the cord and see if the saw starts. Never disengage the chain brake until you are actually ready to make a cut. So, you’ve tried pulling the choke, putting it back in, you pumped the primer bulb several times, and have been tugging at the starter cord for the last 10 minutes but your stubborn chainsaw just doesn’t want to start. What do you do? Do you have to take it to a repair shop or call the serviceman over? Well, fortunately there are some little tricks and tips that we have for the average homeowner who isn’t an expert on small engines and just wants to get the chainsaw running without having to go to a repair center. However, if none of these steps work, you might have to request the assistance of a professional. Have you checked the spark plug? Sometimes, the spark plug gets really dirty and doesn’t ignite the fuel + air mixture properly within the combustion chamber. The procedure to remove a spark plug will vary from model to model, but usually what you have to do is either remove the top cover in order to access the spark plug. Some chainsaw models will have an exposed spark plug cable which you can pull out and the spark plug will be visible to you. You will need a spark plug wrench to remove the spark plug, examine the business end of the plug for excessive soot and carbon buildup. Use a metal brush to clean away all the gunk and rust, then reattach the spark plug and connect the spark plug cable. If the chainsaw still doesn’t start, you might have to take a trip to the local hardware store and buy a new spark plug. Sometimes people leave their chainsaws inactive in some corner of a garage or barn for multiple months, and when they pull it out for duty, the engine just refuses to start up. This could be attributed to an old fuel mix that has been lying dormant in the fuel tank for months. Gasoline undergoes chemical breakdown when left unused for an extended period of time, which is why we recommend that you store your 2-stroke fuel mixes in gasoline storage approved containers only. Drain out the old fuel, and add in some fresh mix to get the chainsaw running once again. Is the ignition coil alright? The ignition coil is what provides voltage to the spark plugs, if this component isn’t functioning properly then your chainsaw engine will never start despite having a perfectly good spark plug. An ignition coil tester can be purchased for 10 or 20 bucks, this will allow you to find out whether it’s the coil or the spark plug that is the issue. If the engine stalls or misfires during operation, it could be a sign of a faulty ignition coil. The air filter is what keeps all the dust and debris floating around in the air from entering your chainsaws engine. However, just like any other filter, this will get clogged up over time, especially if you use your chainsaw frequently and in an industrial/ commercial setting. A clogged-up air filter will prevent the adequate amount of air from entering into the combustion chamber, and this will cause the engine to choke out. Running a chainsaw with a dirty air filter will result in lots of unburned fuel residue and carbon deposits within the engine. Depending on the type of air filter used in your chainsaw, you can either brush away the dirt or you can clean it with soap and water. Refer to your chainsaws user manual for more details on how to clean the air filter. Is the carburetor clogged up? A faulty carburetor means that air and fuel won’t mix in the correct ratio. Cleaning it is usually a task that we recommend you leave to the professionals. If you fail to clean the carburetor, it might have to be replaced completely. Is the recoil starter working properly? Sometimes the rewind spring in the recoil starter system may wear out, while in other cases you might have to replace the pull cord. If you notice that the pull feels a lot heavier than before, or if the chainsaw doesn’t start after several pulls, it is worth taking out the recoil starter system and inspecting it. The spark arrestor is located at the end of the exhaust and it captures all the half-burnt residue and sparks that come flying out of the exhaust system, the arrestor grill may get clogged up over time and will prevent burnt gases from exiting the engine. Remove the spark arrestor and clean it with a wire brush. If it is too dirty, you might have to replace it with a new one. This is an issue that is quite common, yet very few people actually know it exists. A flooded engine is the opposite of a choked engine, it happens when too much fuel gets into the combustion chamber, preventing the engine from cycling normally. A chainsaw engine can get flooded due to multiple reasons however the symptoms are always the same – you can smell fresh fuel coming out from the exhaust, sometimes you can even see fuel dripping out of the carburetor. If you suspect the engine to be heavily flooded, remove the spark plug and take a look at the spark tip. If it is really wet, then you might have to let the engine dry out in the open with the spark plug removed. If the flooding is mild, open the choke (this is the “off” position) and keep the throttle fully depressed as you repeatedly yank on the starter cord. This will introduce air into the cylinder and gradually burn away the excess fuel. One of the main reasons why a brand-new chainsaw engine would get flooded is people overusing the primer bulb by pressing it one too many times. Some people keep the choke on for too long during the cold start process, you are only supposed to keep the choke on for two or three pulls of the cord, just until the engine flutters. Then you should switch off the choke and pull the cord to start the engine. By yanking the cord too many times while the choke is in the “on” or closed position, you are simply introducing too much fuel into the cylinder which will eventually flood it. A faulty carburetor or worn out piston rings/ cylinder heads can also be the reason behind a flooded engine. This is the part of the chainsaw that is responsible for doing all the actual cutting, and while it may seem simplistic at first, we could write an entire article on how chainsaw chains work and the several types of saw chains out there. But since this article is only supposed to give you a brief overview on these topics, let us try and keep it short. A saw chain is visually analogous to a bicycle chain, although there are various differences between the two from a design standpoint. Similar to a bike chain, a chainsaw chain is comprised of multiple sections or “links” that are held together by rivets. There are three types of links found on a saw chain – cutters, drive links, and tie straps. Every saw chain has these three components, and the differences between multiple types of saw chains are because of how the links are arranged, and the way the cutters are shaped. The drive links are there to dig into the drive sprocket and move the chain forward, while the cutting links or cutters are equipped with a cutting edge as well as depth gauge to restrict the amount of wood that is chipped out with each pass of the tooth. Full complement chain: This is the most common type of saw chain that you will see on most consumer grade models, and the type of saw chain that you are most likely to use. Here is how the chain is going to look like – Right cutter head, drive link, tie strap, drive link, Left cutter head, drive link, tie strap, drive link, and repeat. Full skip chain: Usually found on professional grade saws with larger bars (24” and above) that are being used to cut giant pieces of wood, the fewer cutters provide less resistance to the motor while cutting and also aid in chip clearance. This is how the links are arranged – Left cutter head, drive link, tie strap, drive link, tie strap, drive link, Right cutter head, drive link, tie strap, drive link, tie strap, drive link, Left cutter head, and so on. Semi-skip chain: It is designed to combine the strengths of both a full complement and full skip chain into one. The 1st and 2nd cutters will have 3 drive links and 2 tie straps in between them, while the 2nd and 3rd cutters will have 1 tie strap and 2 drive links in between each other. So, it should be something like this – Right cutter, drive link, tie strap, drive link, tie strap, drive link, left cutter, drive link, tie strap, drive link, right cutter. The more cutters you have on a chain, the more resistance is generated as the chain digs into wood. That is why larger saws used to cut giant logs of wood are equipped with semi skip or full skip chains, so more material can be removed in less time. While cutting through thicker material, more debris is pulled out of the kerf, so you need extra space between the cutters to accommodate all that wood chipping and bring it out. Pitch – The average distance between two rivets on the chain. You can measure this by taking the distance between any three consecutive rivets on the saw chain, and dividing that number by 2. The 4 standard pitch lengths are – ¼” (0.25), 0.325″, 3/8″ (0.375) and 0.404″. Larger pitch indicates a larger saw. Make sure the chain pitch matches that of the drive sprocket. Gauge – This refers to the thickness of the drive links on a saw chain, and must match with the inside width of the rails on the guide bar in order for the chain to slide along smoothly. If the gauge of the chain is smaller than the gauge of the bar, it might slip or derail. If the gauge of the chain is larger than the bar gauge, the chain might not fit and if it does, the extreme friction between drive links and the bar rails might cause the motor to stall, and will also damage the bar as well as chain quite heavily. Standard gauges for chainsaw chains are – 0.050″ (1.3 mm), 0.058″ (1.5 mm), and 0.063″ (1.6 mm). Length of the chain – The chain must be of the correct length in order to run properly, and it usually depends on the length of the bar, the size of the sprocket, and the overall saw configuration. Every two consecutive rivets equal one link, or you can just count the number of drive links that a saw chain has in order to figure out the length of the chain. Normally, you don’t need any measuring tools to find out these numbers, since every saw chain will have the pitch, gauge, and length printed or stamped right into the side of the cutter or drive links. However, as you cut wood with the chain, these markings tend to get blurry or even disappear and if the chain is really old you might have to manually measure the figures for yourself in case you wish to order a replacement chain. The pitch, gauge, and length numbers are also stamped on the side of the guide bar, so you can quickly and easily access the data whenever you need a replacement chain/ bar. A dull chain is dangerous for both the chainsaw as well as its operator. You will find yourself pushing down harder on the saw, as it is going to cut slower than normal and also generate a whole lot of smoke and sparks while cutting wood. A dull chain can be easily detected by examining the wood chips that it throws out. Sharp chains will produce a fine sawdust, while dull chains will put out coarse, wooden chips instead of fine dust. You can also examine the chain from a top-down perspective to see if the working corners of each tooth are angled properly and if the point of the teeth are sharp. Then, you can look at the saw chain from the side to find out if the depth gauges are sitting lower than the cutter heads, since every time you file the teeth, you will also have to take down the depth gauges a little bit. Sometimes the saw chain is so worn out or damaged that sharpening it won’t get the job done anymore, you just have to replace it. Another scenario in which you have to replace the entire chain is when you have already sharpened it for a few times, and the cutter face is sitting right on top of the file guide marking line that is present on every single tooth of a modern chainsaw chain. Every time you sharpen that cutter, the working corner will get closer and closer to the guide line marked on the top plate, and at one point the cutting tooth gets so short that you must replace the chain. The first step to take before replacing a chain is to check the Bar ID. Look at the bar for numbers that will tell you about the pitch, gauge, and drive link count (length) of the chain. You can also try to identify the chain type from the markings on the chain itself, but this will be a little harder since usually the markings are worn out if the chain has been in use since a long time. Chains usually contain chain IDs that may or may not give you the exact pitch, gauge, and length numbers, but you can look up these chain IDs on the manufacturers website to order a replacement or find out about the actual chain measurements. Here is a chain ID table that you can reference whenever in doubt. One of the most important components of any chainsaw, a well-maintained guide bar is crucial to cutting smoothly and efficiently. There are plenty of things that can go wrong inside a guide bar even thought it is basically a hollow structure made by slapping together two sheets of metal. In this section we will walk you through the procedure of maintaining your chainsaw bar, and what to do if the bar is damaged and needs replacement. How to measure bar length? Let’s assume your saw chain that’s been serving you well for many months has finally given out, and you need to replace it with a new one. You go to the local dealer for a new saw chain, and he asks you how long the bar is on your chainsaw. You say “16 inches”. So, he gives you a chain based on the pitch and gauge numbers that you provided him with, and then you come home, take out the side panel and fit in the new chain. You then try to tighten it up, but no matter how hard you try, the chain just hangs loose. Well, maybe you measured the entire length of the bar by removing it from the saw. Instead what you should have done is measured bar length while it was still attached to the chainsaw, from the front of the powerhead to the tip of the nose. That gives you the practical or correct bar length. What type of bar does your chainsaw use? Some bars are designed for low profile chains, some bars are equipped with anti-kickback tips, and some bars have front sprockets while other bars lack a front sprocket. All bars have the pitch, gauge, and length imprinted onto the side, so you can quickly and easily access these numbers whenever you need to replace the bar or chain. Each bar also has a Bar ID which could read something like this – 50 3/8 91. What it means is that the gauge of the bar (internal diameter of the bar rails) is 0.050”, the pitch of the sprocket is 3/8”, and the number of drive links that this bar supports is 91. Certain bars also have an oil receiver hole on the front which lets you grease the tip of the bar. Windsor bars have this feature, and you can lubricate the bar tips with a grease gun by pumping in some grease through the hole located near the tip. First, you need to remove the bar and chain assembly from your chainsaw. Separate the chain from the bar and keep it aside. Now, pick up your bar and sight it down from the top rear to make sure that the rails are all smooth and flat, make sure that the edges are not deformed or bent outwards. Take a 90° bar rail dresser and run it along the top of the bar to smooth out any burrs or separation between the rails. Now take a flat file and run it along the sides of the bar (don’t use the flat file on the top where the chain sits). Then, take a business card and fold it in half, run it through the rails to take out all the grit and dust accumulated inside the bar rails. You can also use a metal tool for this purpose. Finally, clean up the oiler supply holes which circulate oil from the chainsaw to the bar and chain. Always remember to flip the bar before you reattach it whenever you sharpen your chain. This is to ensure equal amounts of wear on both sides of the bar. Always use special purpose bar and chain oil to lubricate the bar and chain assembly. The reason for that is the fact that bar and chain oil is designed specifically for use in chainsaws, and it contains a tack agent that helps it stick to the bar even when the chain is carrying it around at extremely high speeds. If you use motor oil, 80 – 85% of that oil will simply fly off the top of the bar and never make it down for re-circulation. Besides, bar oil contains an environmental anti-adherent compound which prevents dirt and dust from readily adhering to the oiler mechanism. This reduces friction and excess load on the motor so that all the fuel you burn is transferred into cutting wood. Finally, bar oil has a really high flash point, so it won’t burn easily. Never try to cut with the tip of the bar. Always operate the chainsaw below waist level if possible. If you are doing a low cut, don’t bend over with your back, instead use your knees to get low and keep your back straight. Don’t cut with the chainsaw positioned in the middle of your body, try holding to off to the side so that if it does kickback, it won’t fly straight into your face. If you are a novice, don’t start with a powerful chainsaw, and always use a kickback guard on the tip of your bar. Using a chainsaw is like driving a car, not only do you want to monitor what the chainsaw is doing, but you must also be aware of the surroundings that you are working in. Never try to modify or remove the chain brake, even if you are a seasoned operator. Always keep the chain sharp, don’t think that a dull chain will cause less damage to your body. If anything, operating a chainsaw with a dull chain is more harmful. Before starting the chainsaw, check the various safety functions such as the chain brake, chain catcher, and stop switch. If you are going out into the woods, always carry a cellphone and loud whistle with you, try to wear bright colored clothing so that you can be easily noticed from a distance. Since we have already talked about how you should maintain the chain and bar, this section will mostly be about the powerhead. Sometimes your chainsaw may not start, or it might stall in the middle of work. Make sure to inspect the spark plug and replace it if you notice too much carbon buildup on the spark tip. Always double check the chain brake before operating your saw. If the engine is generating a lot of soot and burning through fuel more quickly, it could be an issue with the carburetor not delivering the right amount of air and fuel to the engine. Have you stored the chainsaw for many months without following the proper storage tips? Well, in that case moisture will accumulate inside the cold engine block, causing rust to form on the piston head. When you start the engine, this rust will cause the piston to score and eventually your chainsaw will start performing poorly since a scored piston cannot compress properly. A scored piston is also one of the primary reasons behind a flooded engine which can stop the chainsaw from starting. Does the engine stall after starting? Check the spark arrestor, maybe it is clogging up the exhaust. Another reason for a stalled engine might be a dirty air filter. Read the owner’s manual for instructions on how to clean the air filter, since there are several types of air filters out there, and you need to follow the correct cleaning process in order to ensure the safety and proper functioning of the air filter. Always cover the throat of the carburetor with a bit of tape when you detach the air filter for cleaning. Not as much as a gas chainsaw, but you still need to follow some basic procedures in order to maintain your electric chainsaw. For both corded as well as cordless models, you will have to sharpen the chain periodically and refill the bar oil while working. On cordless models, you need to ensure that the battery is fully charged before you get to work, and take care to not overheat the battery or else it will shorten the life of the unit. On corded models, you have to check the power cord on a daily basis to make sure that there are no gaps in insulation. Always do a safety check on the chain brake before you start cutting with any chainsaw, be it gas or electric. If you don’t plan on using your chainsaw for an extended period of time (3 months or more), you must follow the proper chainsaw storage procedure to ensure longevity of the machine and proper function once you decide to run the chainsaw after keeping it inactive for a long time. First of all, you need to take the chainsaw outdoors, set it up on a clean flat surface. Have a fuel container nearby, since you will be storing all the fuel that you empty from the chainsaw fuel tank in this container. The container must be approved for fuel storage, you can’t just pick up an old milk jug lying around in your house and start pouring chainsaw fuel into it. Now clean the fuel cap as well as the area surrounding the fuel cap thoroughly, then empty the contents of the fuel tank into the storage container. If you use premixed 2-stroke engine fuel, you don’t have to drain your chainsaw since those types of fuels are designed to last for up to 2 years without breaking down. If you manually mix your chainsaw fuel by mixing engine oil with gasoline that you obtained from the nearby gas station, you must remove that fuel from the tank and add a fuel preservative compound to it if you wish to use this fuel in the future. Premixed fuels are high octane and ethanol free, and they have preservative agents added in order to prevent the chemical compounds within the fuel from breaking down over time. If your chainsaw has a primer bulb, push it in repeatedly as you drain the fuel tank to make sure that no oil is stuck inside the chainsaw carburetor or fuel lines leading from the tank to the carburetor. Then, put the chainsaw down and attach the fuel cap. Perform a regular cold start and keep yanking at the starter cord until you are absolutely sure that all the residual fuel in the carburetor and gas lines has been consumed. When the engine doesn’t fire anymore, it means that the carburetor and fuel lines are clear. Now, remove the spark plug by detaching the top cover, and examine it for any issues. Clean the spark plug if necessary. Take a can of fogging oil (most of them come in aerosol form), and spray the insides of the engine through the open spark plug hole. Tug the starter cord to get the piston cycling, this will ensure that the fogging oil is spread evenly across the piston and cylinder. Now reattach the spark plug and top cover. If you haven’t cleaned the air filter in a while, take it out and clean it. Refer to the chainsaw owner’s manual for cleaning the air filter since not all air filters are cleaned the same way. Since we are done with the powerhead, it is now time to ready the bar and chain assembly for storage. Clean the bar oil cap and clear any debris that might be surrounding it. Some chainsaw manufacturers will recommend that you fill your chainsaw with bar oil before storing it, since you don’t want parts that have been covered in bar oil to dry up. However, you might want to completely drain out all the bar oil if your particular chainsaw model tends to leak oil when you keep it stationary for extended periods of time. Check the manual for more details pertaining to your specific chainsaw model, and whether you should or should not empty the bar oil. Now, it is time to remove the bar and chain, and clean them thoroughly. Clean up the bar rails and unclog the oiler holes. Once you have cleaned the bar and chain, let them dry out in a well-ventilated area. Then, coat them with anti-corrosion oil. Now your chainsaw is finally ready for storage. If you have a carry case for the chainsaw, you can store the bar and chain separately. If you don’t have a carry case, reattach the bar and chain and store the chainsaw in a safe place with the sheath/ scabbard attached.